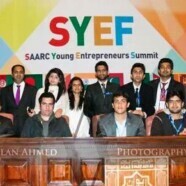 For the first time Rotaract Club got an opportunity to work as the organizer and the host team for the first SAARC Chamber Young Entrepreneurs Forum (SYEF) which is an initiative of SAARC Chamber of Commerce and Industry (SAARC CCI) to bring together young business professionals and leaders from various business sectors of South Asian countries. The event was held at Governor’s House and Awan-e-Iqbal. Delegates from SAARC countries were present for the conference. The Rotaractors of FCC had a great experience interacting with these delegates and the club is proud to have represented Forman Christian College at this international conference.